On June 25, the Supreme Court ruled on the case of Shelby County v. Holder, declaring part of the Voting Rights Act (VRA) of 1965 unconstitutional in a 5-4 vote. The VRA had established a formula that identified certain counties, cities and local governments as subject to a "preclearance" provision put in place to minimize voting discrimination. The provision required these state and local governments to obtain approval from the federal government before changing any voting procedures. 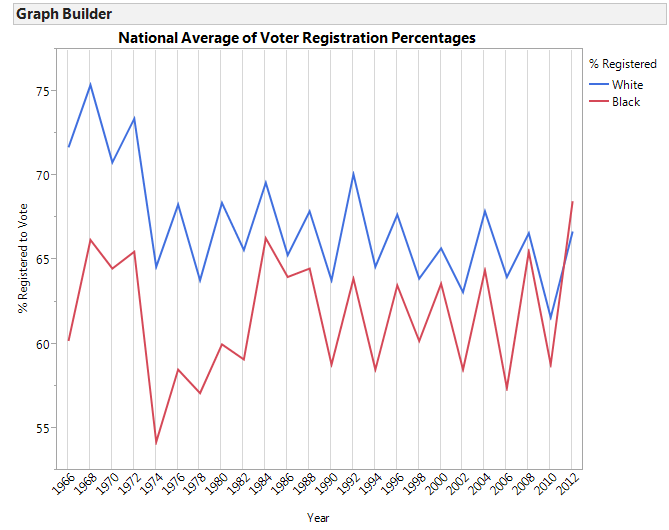 Some of us here at SAS thought it would be interesting to use JMP to graphically represent this voter registration data, as well as compare it to the national average during both time periods using election data from the US Census Bureau. There are a hundred different ways to do this, but I picked a few of my favorites and included them below. Let me know what you think! Although in later years, other states were found to meet the criteria for preclearance under the VRA, I have chosen to stick to the six states that were originally subject to the provision: Alabama, Georgia, Louisiana, Mississippi, South Carolina and Virginia. These visualizations are limited to those six states and do not include the counties and local governments from other states that met the criteria, such as those in North Carolina. 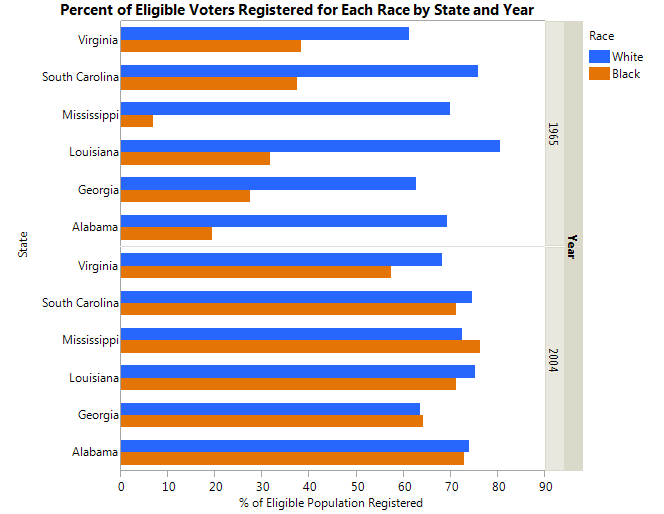 One way to visualize this data is a bar chart, with the voter registration percentage broken down by race and state as it is above. 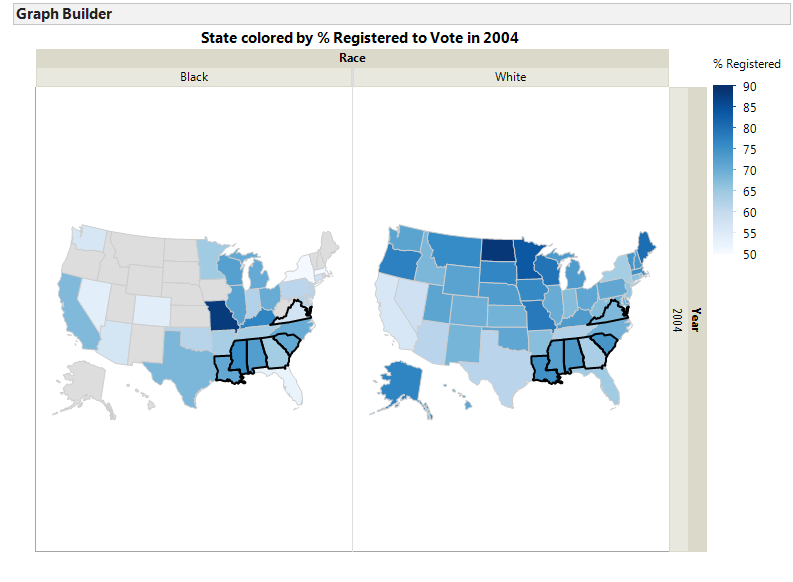 The upper half shows black and white voter registration percentages by state for 1965, and the lower half shows the same comparison in 2004. 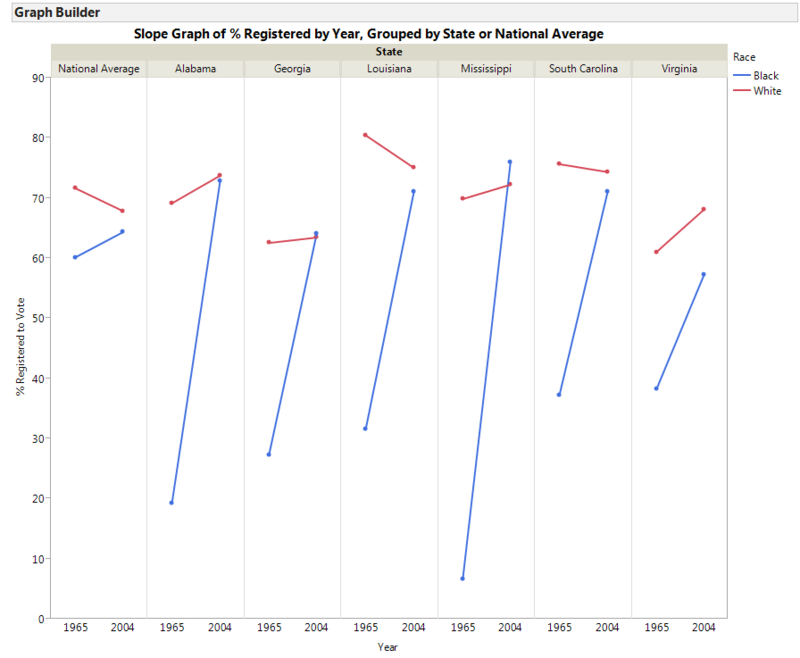 I chose a bar graph as the first visual because in a glance you see a difference across all six states between 1965 and 2004, and then with a closer look you can examine the change for individual states. 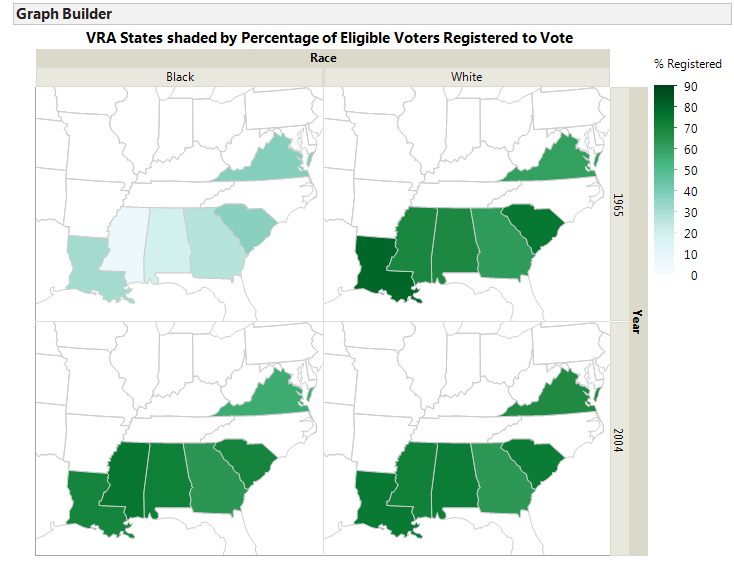 A second way to visualize this data is to show maps of the six states named by the VRA preclearance provision shaded by percentage of eligible voters registered. 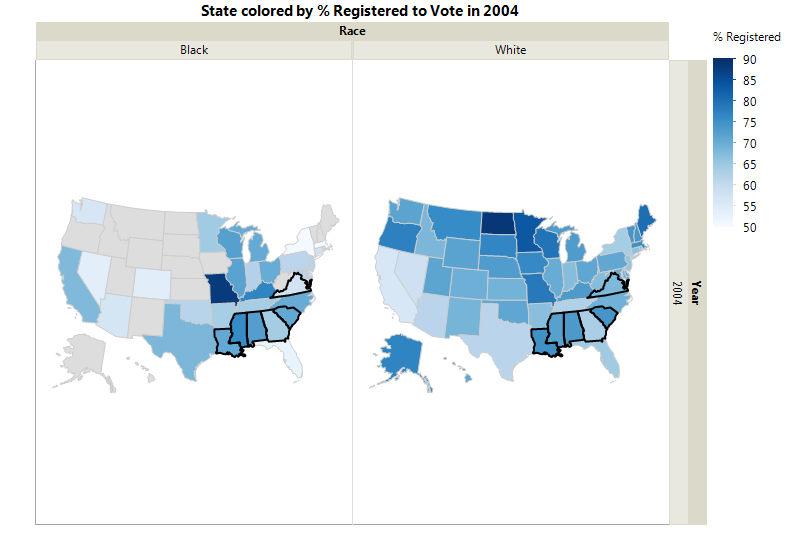 This chart contrasts the percentage of eligible black and white voters who were registered to vote in 1965 and 2004. I like to include the map element because it adds an extra dimension to the graph without relying on text and makes it easy to compare not just individual states, but the group as a whole. 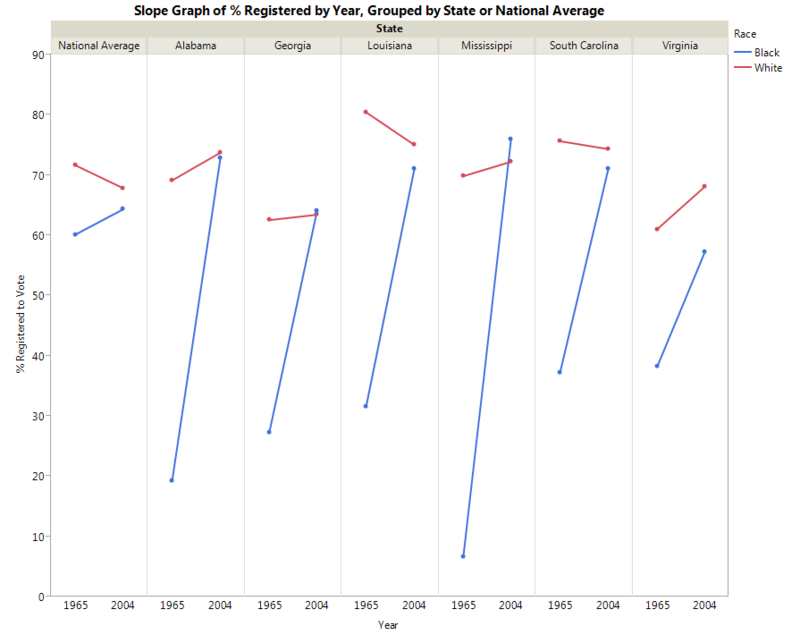 So far we have seen how voter registration numbers compare for the six original VRA states between 1965 and 2004. Next, we’d like to compare the voter registration numbers for those states to the rest of the country. I headed to the US Census Bureau website, hoping to find some historical election data to use as a baseline in comparing these six with the rest of the states. 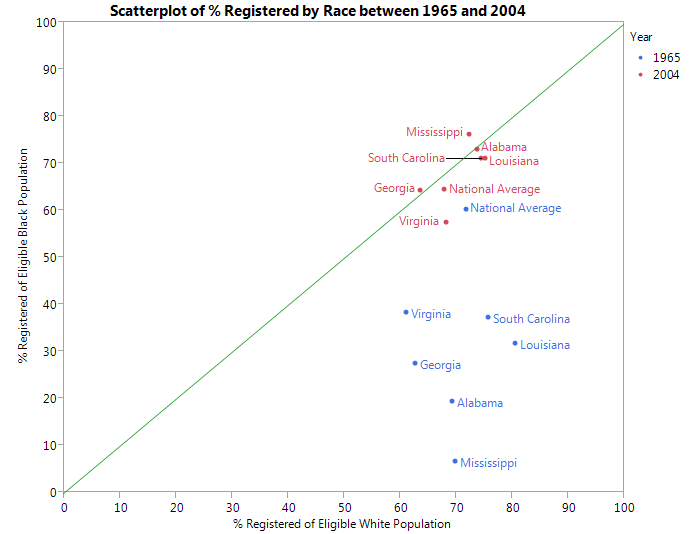 I was able to find eligible voter registration percentages by race for each election dating back to 1966. This data is in the form of a national average instead of by state. The only issue with using the data in this post is that it dates back to 1966, and I need to compare it with the data in the Supreme Court ruling, which is from 1965. For this reason, I focus on showing differences in the percentages rather than the specific values, but just keep that in mind while reading. A good way to visualize this national data over time is with a Connected Line Plot showing the time period from 1966 to 2012. The plot includes registration percentages taken every two years, and there is significantly less registration for the midterm elections as compared to the presidential elections. For my next graphic, I chose to pull the national averages from 1966 and 2004 and graph them alongside the Supreme Court’s VRA data. 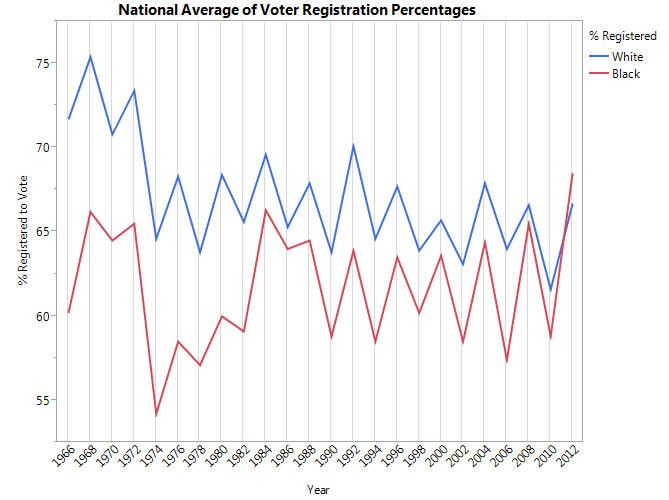 Using these statistics, I created a slope graph that clearly shows the change in registration percentage for the whole country as well as for the six VRA states. The national averages are found on the far left of the graph, and the lines are colored differently to indicate race. This is one of my favorite graphs for comparing data in small groups because in addition to seeing the beginning and end, it enables visualization of the rate of change. By including the national averages, my intention is to give context both to the passage of the Voting Rights Act in 1965 and to the Supreme Court decision of this year. Another great tool for depicting the relationship between two variables is the scatterplot. 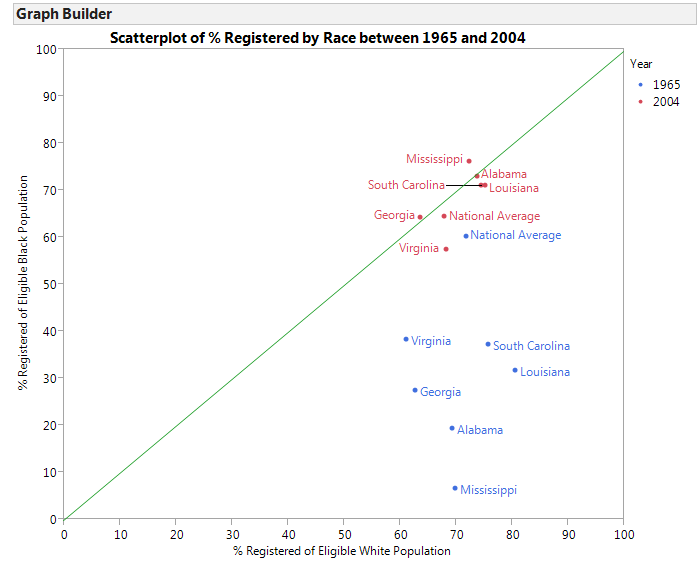 On the X axis, you will find the percentage of white people registered, and on the Y axis the percentage of black people registered. The data points are colored by year, and the green line indicates where % white = % black. At first, I had difficulty understanding the value of the scatterplot, but once I wrapped my head around the role of the axes, I started to appreciate all the information that this graphic communicates. It may take more than a glance to comprehend, but the extra time is worth it. The migration between the red and blue points is decidedly vertical, indicating an increase on the Y axis but a much smaller change on the X axis. One last trip to the US Census Bureau Website turned up the data I needed for a final comparison: a breakdown by state and race of percent registered to vote in the 2004 election. The grayed out states on the left map are missing data because the base population is too small to yield reliable voter registration percentages. My favorite graph for this data set is the side-by-side map, and unlike the first map in the post, which only included the six VRA states, this map provides the context of comparison with the whole country (except for the states with missing data). All together that’s six different graphs showing closely related data, and there were plenty more I could have included as well. The various platforms in JMP are very helpful on their own, but hopefully this post has shown you the even greater potential when combining them and visualizing the data from different angles. What other graphical platforms would you like to see applied to this data? How about ideas for enhancing the graphs in this post? I’ve already got a few ideas just from reading about the new features coming soon in JMP 11! Excellent examples of the use of JMP graphs to describe topic in the news. Seeing how someone else approaches visualization is a good way to improve my JMP skills. Please keep adding ideas like this to the blog. Great use of the formats to show the change. I'd agree that the slope graph is the most powerful visual indicator of the change. How can you integrate the actual number of voters though? I think that would be helpful to get the whole picture. Even as the % of black voters increases and the gap between % of voters is either minimized or a wash, the viewer would need to locate their own data on what this actually means in terms of numbers of voters. With each of these six states being occupied by 65-70% white people and 15-20% black people, showing graphs that represent the # of voters would also be helpful and might further shed light on the vast differences in 'voting power.' Awesome work... thanks for sharing! Thanks for your feedback! You make a great point â the percentages make for an easy comparison but they donâ t necessarily show the whole picture. I was a bit constrained by the data available from elections in the 1960s but it would be great to include another map with these graphs that show the states weighted by population registered to vote rather than by percentage, and show the difference between race.